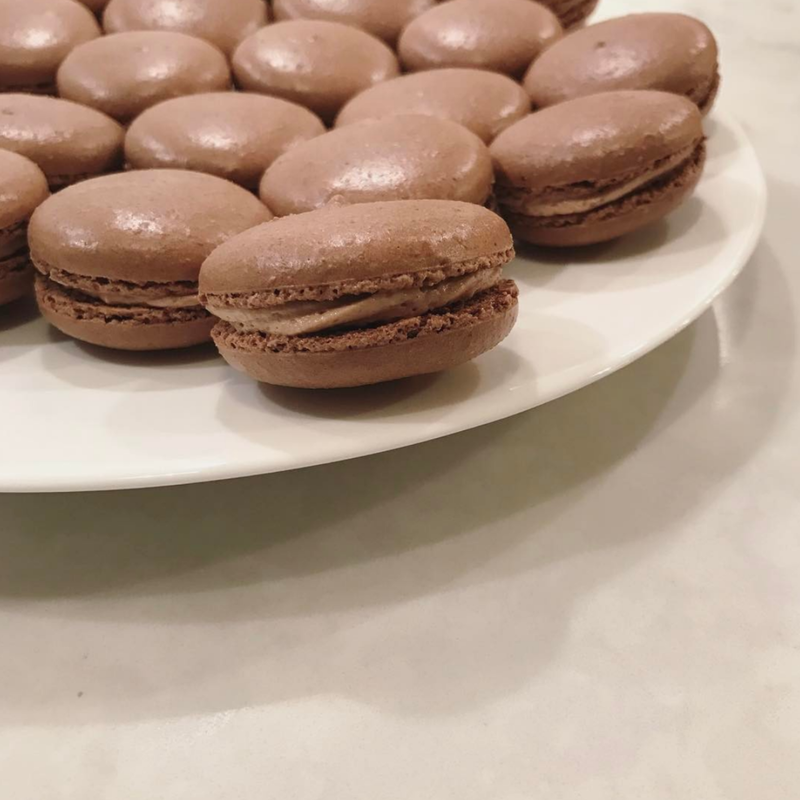 I learned the recipe for these shells at the french pastry school in chicago, and it turns out great every time. if you don’t already have a kitchen scale, I super recommend getting one; they’re not very expensive and they make recipes consistent and accurate, especially for a finicky cookie like a macaron. make sure you get one that allows you to tare the weight of the bowl holding the ingredients so that it doesn’t count that bowl in your measurement. having said that, the buttercream recipe I use (from kitchentreaty.com) is in cups, teaspoons, etc. from “mixture a,” sift together the cocoa powder, almond TPT, and powdered sugar into a large bowl and set aside. (it’s important to sift to make sure everything is very fine). take the egg whites from “mixture a,” plus a spatula full of the meringue and mix it into the sifted almond, cocoa, powdered sugar mixture that you made earlier. fold this together with a spatula until you form a thick paste. add nutella and mix on 6 for two minutes. add the vanilla and salt, then whip on 8 for 30 seconds. scoop into pastry bag and fill the center of your macarons. pipe a blob onto the flat side of a shell, large enough so that when you twist another shell on top of it, the filling reaches and shows at the edges. (or fill it however you want. maybe do it with a star tip to make it look a little fancier, or frost the middle with a spatula instead of a pastry bag for more of a rustic look). eat all of them. or practice self control and place in an air tight container and store in the refrigerator for up to a week.